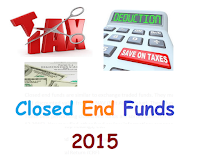 Find best tax advantaged stock closed funds in 2015. Top 8 funds are EV Tax Advantaged Global Dividend Income fund, Nuveen Tax-Advantaged Total Return fund. Investing in these funds may lower your tax bill. Tax advantaged equity funds invest mainly in dividend stocks. The fund objective is to maximize after-tax returns by investing in dividend stocks. The fund may use active tax management to maximize their return or yield. While many stock closed end funds distribute a portion of qualified dividends to investors, few focus on these preferential dividends as an integral part of the strategy. Some of these equity funds also manage capital gains and losses in an attempt to make the portfolio tax-neutral from a capital gains perspective. This Eaton Vance fund invests mainly in dividend paying common and preferred stock. It has total net assets of $1.81 billion. The current expense ratio fee is 1.42%. The current dividend yield is 7.46%. The current market price is trading 9.24% discount from its NAV (Net Asset Value). As the top performing tax advantaged stock closed end fund, this this fund has returned 3.72% over the past 1 year, and 13.77% over the past 5 year. Morningstar has ranked this fund with 4 stars rating. This fund has 202 holdings in its portfolio. Top 5 stocks are Natixis, AXA SA, Google Inc, Vodafone Group Plc, and Deutsche Telekom AG. Top 3 country allocations are USA (51%), UK (14%) and France (8%). This Nuveen Tax-Advantaged Total Return Fund objective is to provide a high level of after-tax total return consisting primarily of tax-advantaged dividend income and capital appreciation. It has $290 million of assets. The fund is introduced to investors in 2004. The fund managers are Susi Budiman, Thomas J. Ray, James T. Stephenson, and Gunther Stein. Its expense fee is 1.85% per year. This tax advantaged stock is ranked with 4 stars rating by Morningstar. In 2015, the year-to-date return is 1.51%. It has a 3 year average return of 15.29%. This John Hancock Tax-Advantaged Dividend Income Fund utilizes its assets to purchase dividend paying common and preferred stocks. Its total net assets are $1.2 billion. The annual expense ratio fee is 1.55%. The fund sponsor is John Hancock Advisers LLC. As of August 2015, this top tax advantaged stock fund has 119 holdings. The annual portfolio turnover rate is 7%. The top 5 stocks are Interstate Pwr & Lt Pfd, NiSource, Inc., Metlife Pfd 6.50, Wells Fargo & Co, San Francisco Ca Pfd, and American Electric Power Co Inc. Top 3 sectors are utilities, financials and energy.